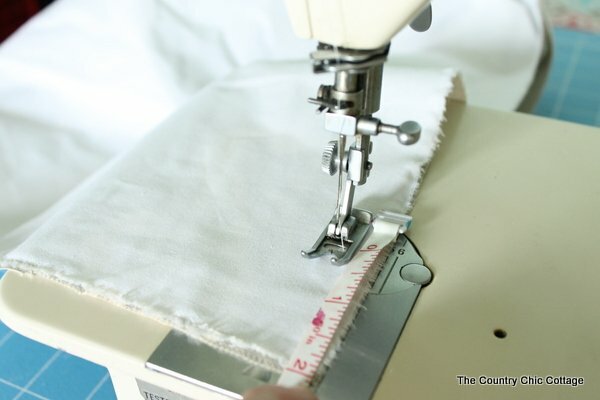 If you can sew a straight line then you can learn how to sew curtains. They really are that simple. 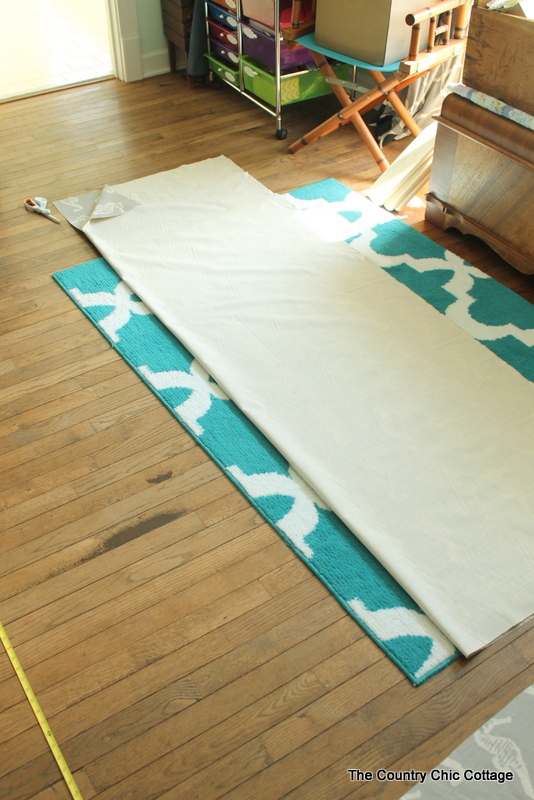 I have already showed you how to sew a simple valance and now it is time for some full length drapes. I am continuing on in the upstairs bathroom and I hope to have a reveal for y’all soon. For now lets learn how to sew curtains the easy way! 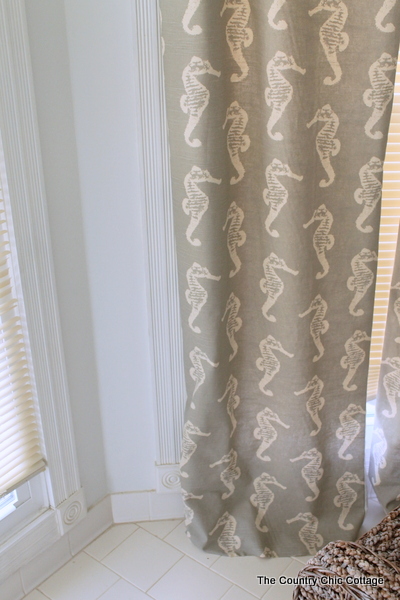 The fabric for these curtains is this sea horse print in coastal gray from Online Fabric Store. I was given a discount on my fabric in exchange for a mention in this post however all projects and opinions are my own. This fabric is 54 inches wide (please note this for future reference below). Start by measuring your window from where the the curtain rod will be to the floor. Add 5 inches to that measurement. Cut your fabric to size. I laid mine out on the floor as that is the only surface really large enough to accommodate this project. Fold the fabric in half and cut down the center. 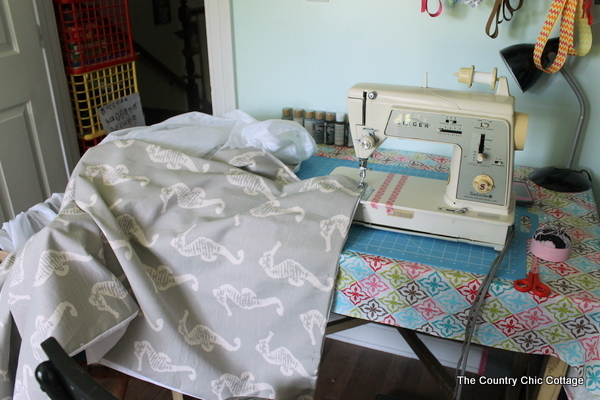 You now have two 27 inch wide pieces of fabric. For this project I left my selvedge edges attached as they are hidden by my seams. You can remove if you are worried about it. I am lining these drapes as I love a lined curtain on my windows. I used some drapery lining fabric that was 96 inches wide. I was able to just cut it to width for now and length in a later step. 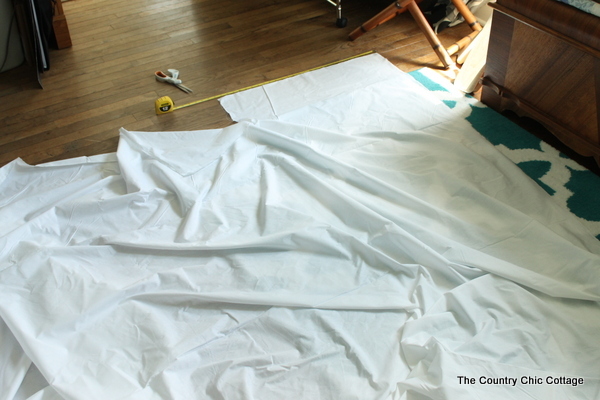 So this needs to be as wide as our half sheets of fabric turned out to be above. In my case that is 27 inches. 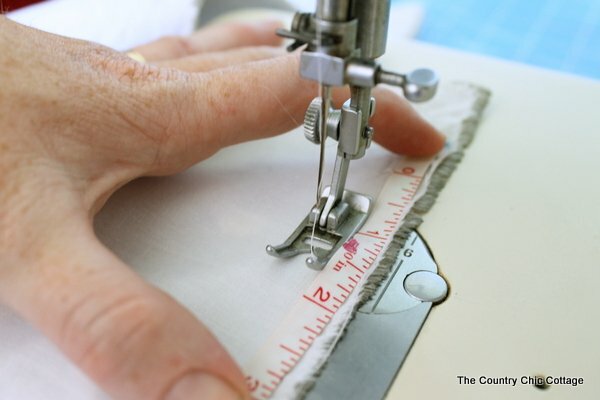 Please measure your fabric before you do any cutting. Now for sewing those straight lines. 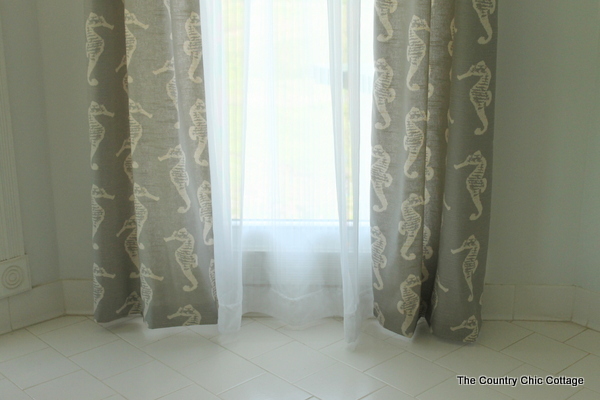 The following tutorial will give you about 1 1/2 inches at the top of the curtain rod as shown in the image below. If you don’t want this look, I will show you below how to eliminate it as well. Start on one side 2 inches from the top and sew up to top. 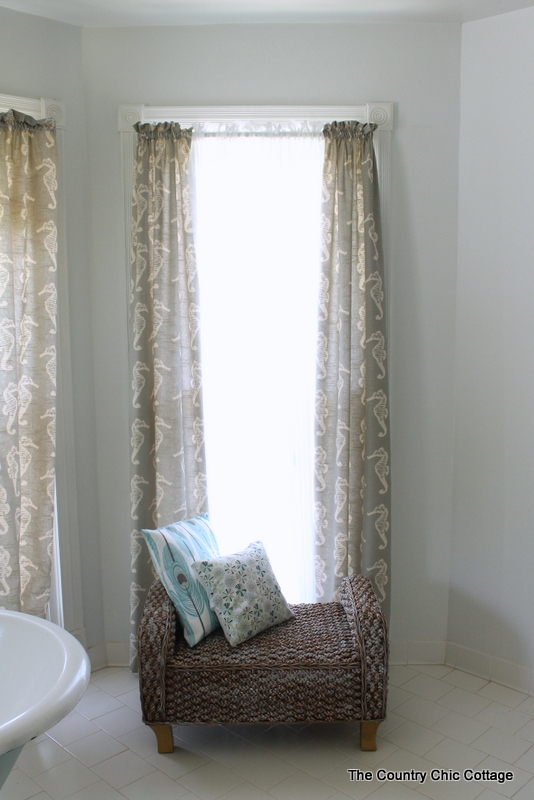 (Skip to step 2 if you DO NOT want extra material above your curtain rod. 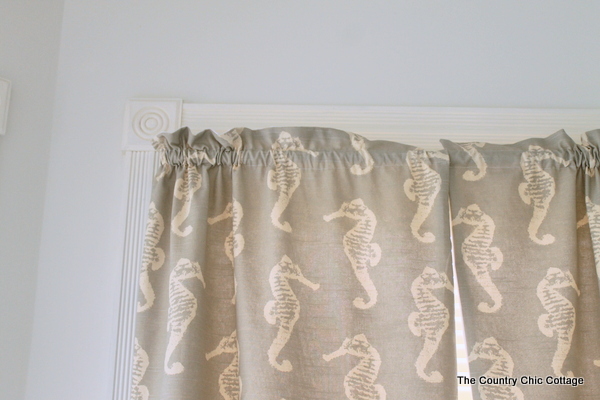 Sew down opposite side 2 inches (skip this step if you DO NOT want extra material above your curtain rod). Skip down for a rod pocket. Mine was 1 1/2 inches but if your rod is larger you will have to skip a larger area. Sew all the way down the side stopping 2 – 4 inches from the bottom. Repeat step 4 but on the opposite side. Here are some pictures illustrating what your sewing machine will look like as you do the above steps. I used a measuring tape to get my needle in the correct place before beginning to sew. 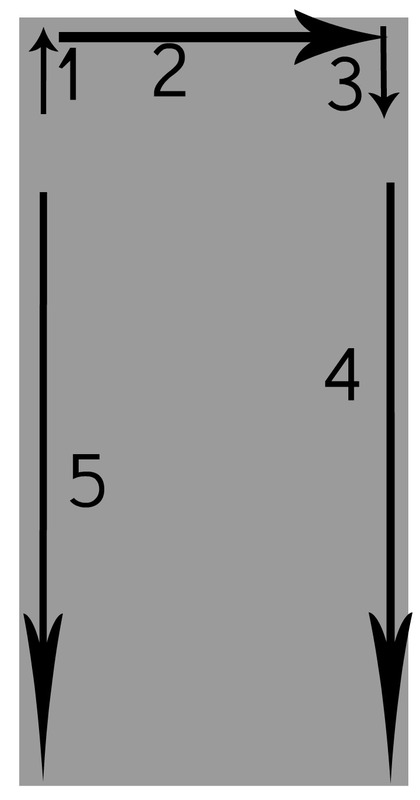 The following image is for step 1. For step 4 and 5, I used the same method with the measuring tape. Once again, customize this measurement to your particular curtain rod. The first measurement will be 2 inches minus the seam allowance of 1/2 inch so it is at 1 1/2 inches. The second measurement will be 1 1/2 inches from the above calculation plus the 1 1/2 inches we skipped down for steps 4 and 5 above. 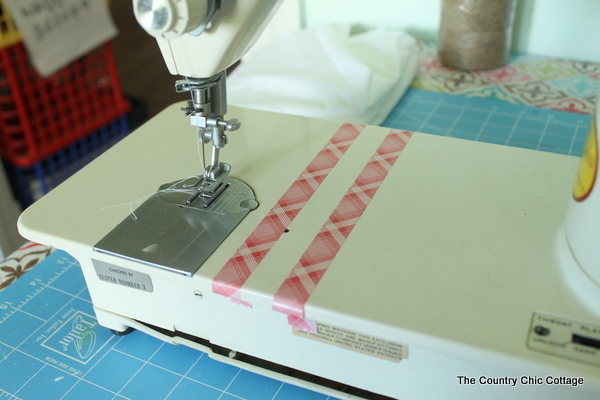 Measure and place tape on your sewing machine as shown. Sew two lines all the way across the top of your curtain using these tape lines as your guide. You can now hang the curtain on the rod. But…Angie….the bottom is unfinished!?!?! Yep it is. Hang it up. You will thank me later. 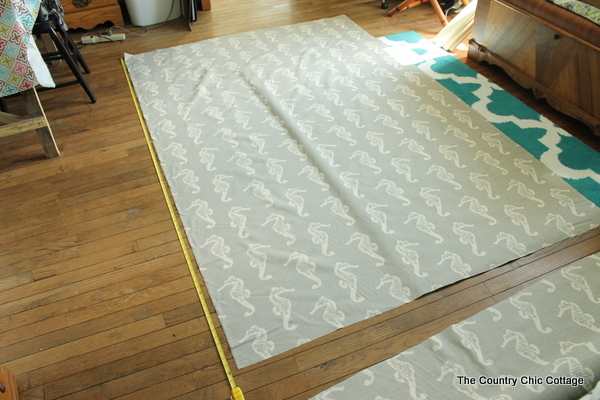 You can now trim the lining to length (if you followed my instructions above it is longer then the curtain fabric). Then use pins to pin up to your own desired length. Turn the fabric inside to do this so you will have a finished edge on the bottom (both front and back). For a bathroom I want them just slightly above the floor. Curtains on the floor in a bathroom does not sound great to me personally. You can leave your curtains pooling on the floor or make them even shorter than mine. This is how these are custom to you. Then I literally take it down still on the rod and set up my sewing area to accommodate. A chair works wonders to rest the bulk of the fabric and the rod on. Sew as close to the bottom as you can (a 1/4 inch seam allowance works well). Hang your finished curtains up and you are done. Sigh with relief. Then realize you have four more sets to make. Sigh again. NOTE: I bought the shears at the store and just hemmed them to length as well. If y’all need me I will be in my sewing room finishing up this job. Y’all stay tuned for a full bathroom reveal soon. 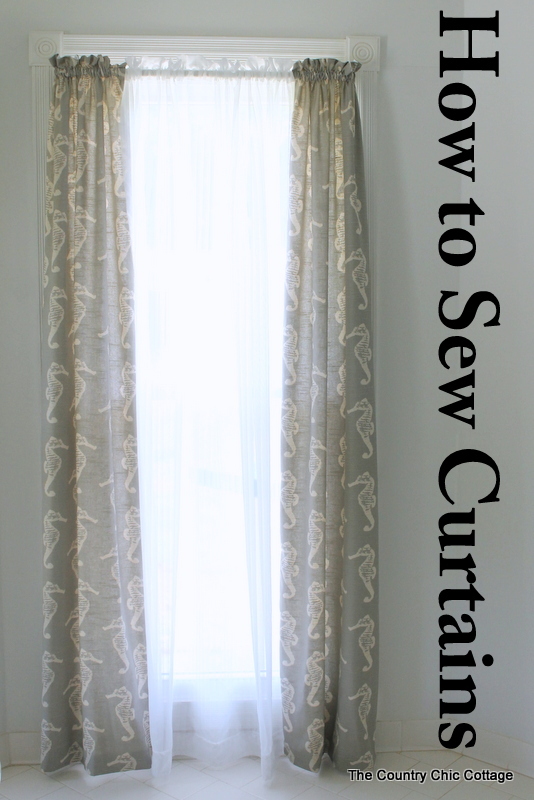 In the meantime, bookmark this post so you know how to sew curtains when you want to redo your room. Be sure to order this fabric or any other from Online Fabric Store. For more projects in this room, be sure to read the painted wicker tutorial and how to paint a claw foot tub. I was given a discount on my fabric in exchange for this post however all opinions and projects are my own. Great tutorial Angie! I’m about to embark on some curtain making so it was very timely, thanks!!! 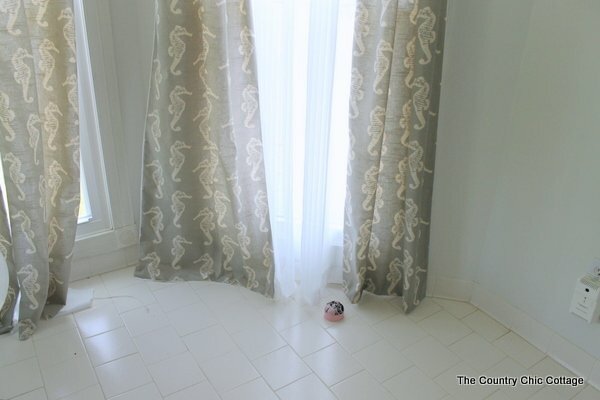 Your curtains look fabulous and I love how easy your tutorial was to understand! I love that fabric and the color! Thanks for the tutorial! Easy to follow and the fabric is beautiful! These look great – you made it look so easy. Also I love the tape guide tip! !